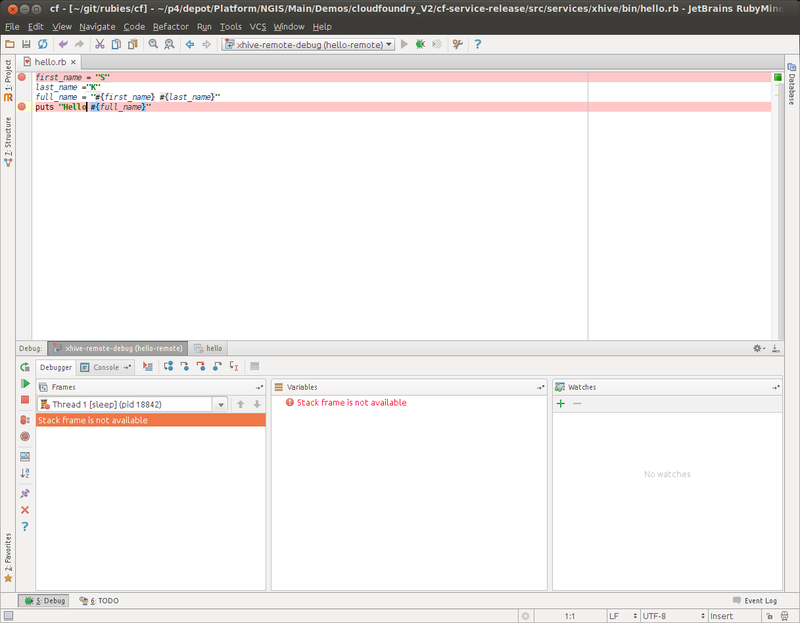 The RubyMine connects to the debugger but it does not display anything in the debugger window. I can step over to next breakpoint and complete the debug but no stack. I have attached screenshot for reference. BTW... If I run the server-side command locally then I am able to see the stack and variables. Do you have Gemfile? If yes what is in it? Also I'd suggest to run debugger in verbose mode (Settings|Debugger|Ruby) and provide the output it produces. I enabled the verbose debugger option in "Settings|Debugger|Ruby" but I did not get any output in the client side (IDE) and I even looked at the ~/.RubyMine50/System/logs/idea.log but not output either. I enabled debug on the server side. I have attached the output. I create two scenario, 1. both server and client runs on the same machine 2. server and client on the different machine. Please see the attached file. I can see lot more information (including variable information) if I run both on the same machine but it does not available if server and client are different machine. I forgot to mention that there is no Gemfile. I am keeping it simple for now that the script is just 4 lines.